Valentine's Day is nearly upon us. There's quite a difference between the way this holiday-that-isn't-really-a-holiday is celebrated in Japan vs. elsewhere. In most western countries, Valentine's is a day for couples to spend some romantic time together at a restaurant or such. And when it comes to gifts, typically within heterosexual couples the man sends flowers or chocolates or a card to the woman. But in Japan, things are rather different. Valentine's Day is of course an imported holiday with no established traditions in the country, so when it was introduced by confectionery makers to the general public in the late 1950s, it was marketed as a day when chocolate giving was a must - and that it de rigueur for women to give chocolates to men. (There are records of a confectioner in Kobe selling Valentine's Day chocolates as early as 1936, but it seems they marketed them to the expatriate population living there at the time rather than Japanese people.) According to an article in the Yomiuri Shimbun newspaper that appeared in 1998, the first mention of Valentine's Day was by a chocolate company called Merry Chocolates, who put up a hand-written sign at their stall within Isetan department store in Shinjuku, Tokyo in 1958 saying "Valentine Sale". The sign had little effect the first year, since only a few chocolate bars were sold. But the next year, they displayed some heart-shaped chocolates, and the sign read "For ladies [to give] to gentlemen". This time the ploy worked. Another source which conflicts somewhat with the Merry Chocolate story is that Fujiya introduced a Valentine's Day compaign in 1956. an In 1960, Morinaga Seika (Morinaga Co. Ltd.), one of the major confectionery makers in Japan, started pushing the idea of women giving men chocolates on Valentine's Day in a big way via national newspaper ads. The Valentine's Day chocolate 'tradition' became firmly established in the '60s, and by the '70s was a big business. This is around the time the idea of giri choco, or obligation chocolate - chocolates given by females to males to whom they have no romantic feelings whatsoever, such as bosses, teachers and so on, for the sake of giri or a sense of obligation, became established. This Japanese Valentine's day tradition has its roots in the way the society still regards male-female relationships. In the 1950s-60s, the concept of a female revealing (or kokuhaku - confession of) her feelings to a male was considered quite radical and forward. Chocolate makers used this very cleverly to establish a day when it was "acceptable" for female to express their feelings. This whole 'confessing your feelings' thing still exists in Japan, where romantic relationships still tend to not be easy to get going, from either side. You might think that people are loosening up in the 21st century, but the opposite seems to be happening, with more people than ever staying single for longer, with a significant number of people never marrying or getting into serious relationships at all. Honmei choco (本命チョコ）- "real objective chocolate" - that is, chocolates given to the one you really have feelings for. Giri choco (義理チョコ）- as explained above, these are "obligation chocolate" gifts, given by females to males to whom they have no romantic feelings whatsoever. Giving giri choco to people above them in the social pecking order such as bosses, teachers, senpai (older students or people older/more experienced than you at your workplace or school) and so on, for the sake of giri or a sense of obligation, is kind of a must, but they are also given colleagues, classmates, people in the same activity group/club and so on too. Giri choco are usually nice looking but cheap chocolates. Giri choco has become so ubiquitous that a few companies have even banned them, encouraing employees to donate to charity and so on instead of buying these essentially meaningless chocolates. Tomo choco (友チョコ) - "friend chocolates" - chocolates given to or shared amongst friends, usually just female friends. In other words, using Valentine's Day as an excuse to pig out on chocolate. Tomo choco is usually expensive, show-off stuff or homemade. Jibun choco (自分チョコ) - "self chocolate" - chocolates you buy or make for yourself, to consume alone - see tomo choco. 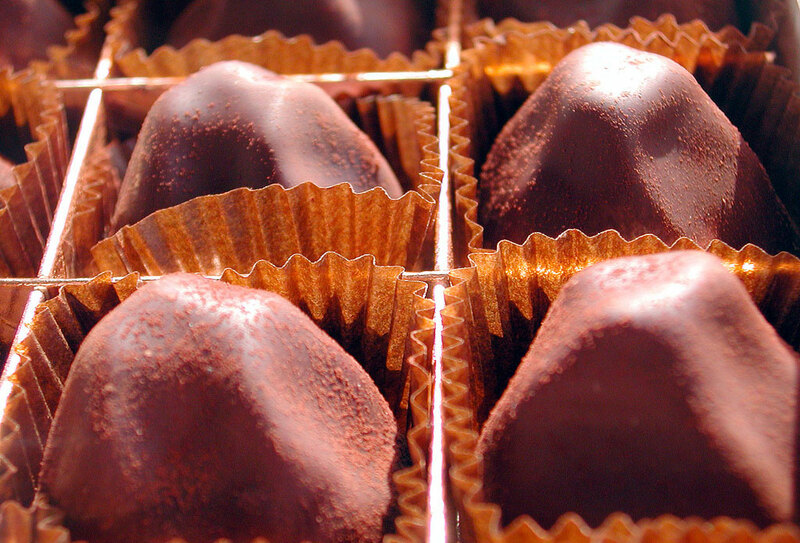 According to a recent survey, people spend by far the most on this category of chocolates. March 14th is designated as White Day, when males who received chocolates from a female on Valentine's Day give back a gift - because in Japan, okaeshi or given something back when you receive a gift is a must. Submitted by maki on 2016-02-08 13:46. It has been awhile since I have seen a post from you. I am so happy to hear from you. Valentine's Day in Japan is definitely different. I am all for the tomo choco and jibun choco. I have an unrelated question for you. Can you tell me if there is any special way 100th birthdays are celebrated in Japan? My aunt will be turning 100 next month, and I was wondering the best way to help her celebrate it. Thanking you in advance. I love the recipes in your book and your justbento blog. One of my favorites is the cabbage, garlic, and cranberries since it is so quick and easy, and I usually have the ingredients on hand. Congratulations to your aunt! The only special thing I know of for someone's 100th birthday is to give them something peach-colored, or white, since the term for ones 100th birthday is 百寿 - hyakuju, which can be read as 'hakuju' (haku=white) or 'momoju' (momo=peach). There are a lot more things for younger birthdays though, especially the 60th. Hello, Maki. Good to see some activity on your blog. I'm replying because I usually don't get my honey a valentines gift (though he does come through for me with the chocolates pretty regularly) but this year, I bought us a pair of handmade wrought iron long toasting forks. It doesn't seem terribly romantic until you think about cozying up next to a fire to roast marshmellows or wursts. Hello again Maki! I dropped by today after a long hiatus, looking for ways to use lotus root, and of course you have some delicious-looking options! I'm going to experiment with the lotus root croquette idea. Ever since I bought your Just Bento Cookbook I've been learning more and more about Japanese cooking. So many great flavours I knew nothing about just three years ago are now mealtime necessities for me. I'm really glad the Just Hungry site is still active. Hope you are well and happy!